Koovs Marketing Pvt Ltd, the company that owns and operates the lifestyle e-commerce player Koovs.com is planning to go public in 2014, according to a Financial Times report. The company plans to raise $35.5 million (Rs 221.7 crore) with a listing on AIM, a sub-market of the London Stock Exchange, which allows smaller companies to float shares with a more flexible regulatory system than is applicable to the main market. According to the report, the owners plan to float about 35 per cent of the company, while the remainder will be split between the Nahata family (which already owns about 44 per cent of Koovs); Waheed Alli, chairman, Koovs (who holds 11 per cent), and the company's management. Co-founded by Rajesh Kamra, Manish Tewari, Kanishk Shukla, and Amit Shukla, Koovs was earlier a deal site but in May 2012, it stopped offering deals completely and pivoted to be a lifestyle e-tailer. The company had earlier shifted its focus to products but was still offering daily deals in a separate segment. Currently, it offers a mix of private label and branded merchandise. Early last year, Delhi-based B2B rewards and loyalty programme firm BenefitsPLUS Media Pvt Ltd acquired a majority stake in Koovs for over $2 million. In April 2013, the company had roped in Alli and Robert Bready as chairman and creative & retail director, respectively. 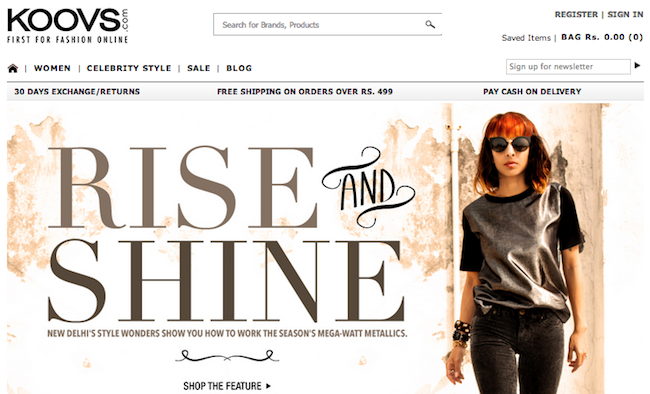 Prior to joining Koovs, both were working with British e-tailer Asos.com. While Alli was the chairman there, Bready was product and trading director at Asos. "There are general retailers, like Amazon, but there are no other fashion outlets online. This market will be conquered by us, or it won't. It's binary: you either win or lose," Alli told FT.
Koovs is also planning to launch a menswear range early next year, since India has more male than female clothes shoppers online.